Thankfully, about a week after we arrived, the weather cleared up for a bit and we enjoyed the sun, even though biting cold had arrived as well. 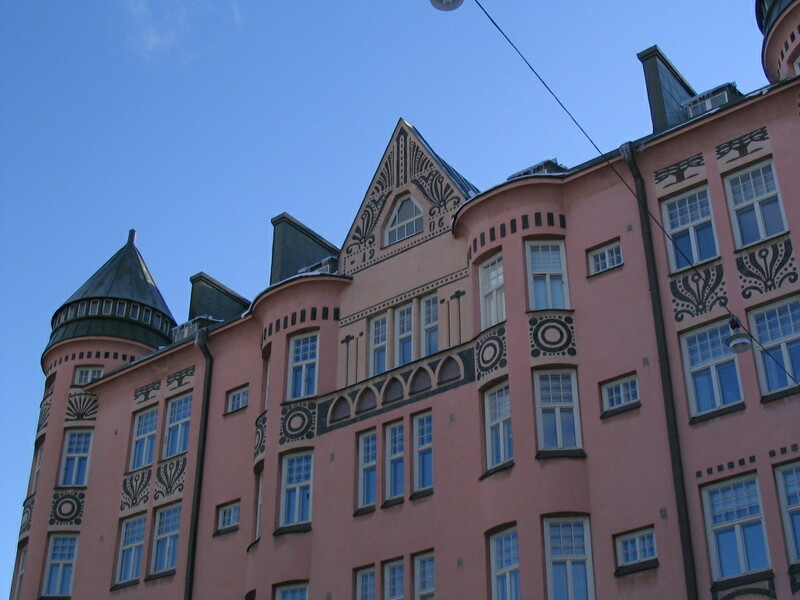 I went with Ali to explore the neighborhood of Kallio, which is directly north of downtown. But first, here's a view out my bedroom window that morning. 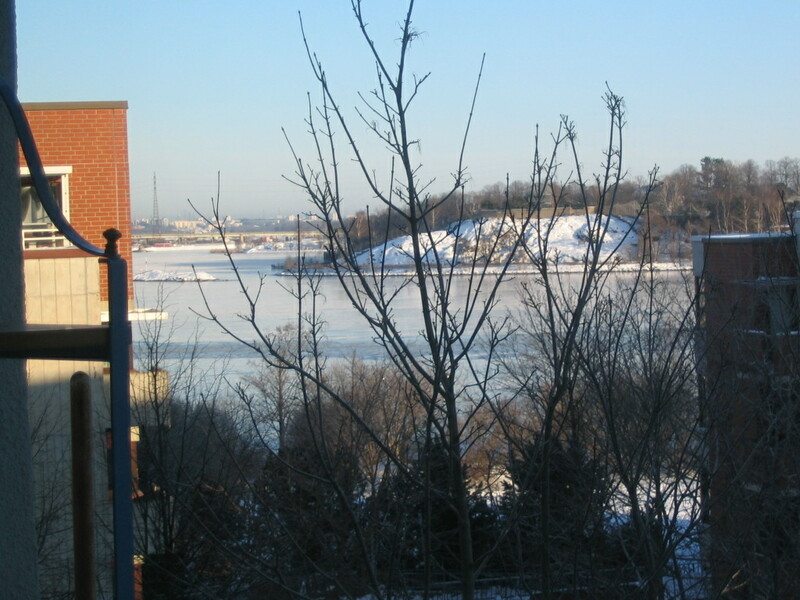 The view is northeast across the bay to the island of Korkeasaari, where the Helsinki zoo is located, and further out to mainland neighborhoods. 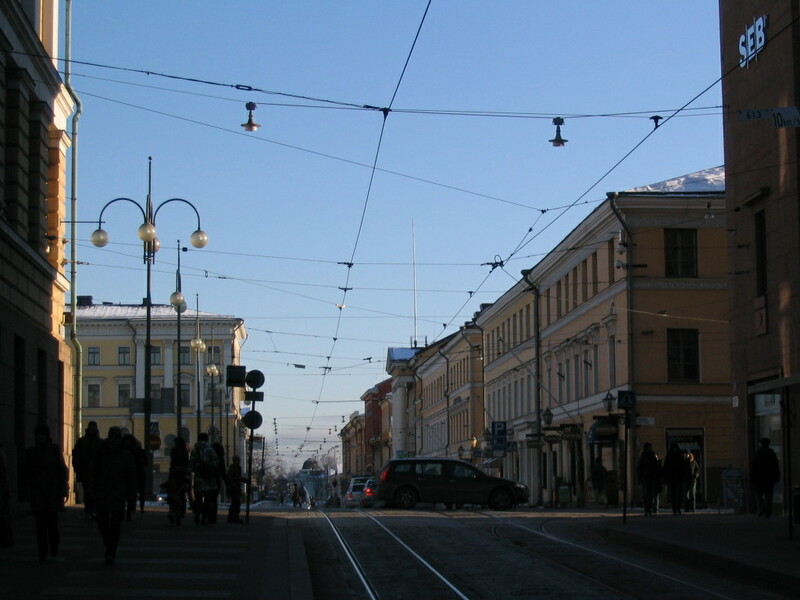 A look down the street from Merisotilaantori. 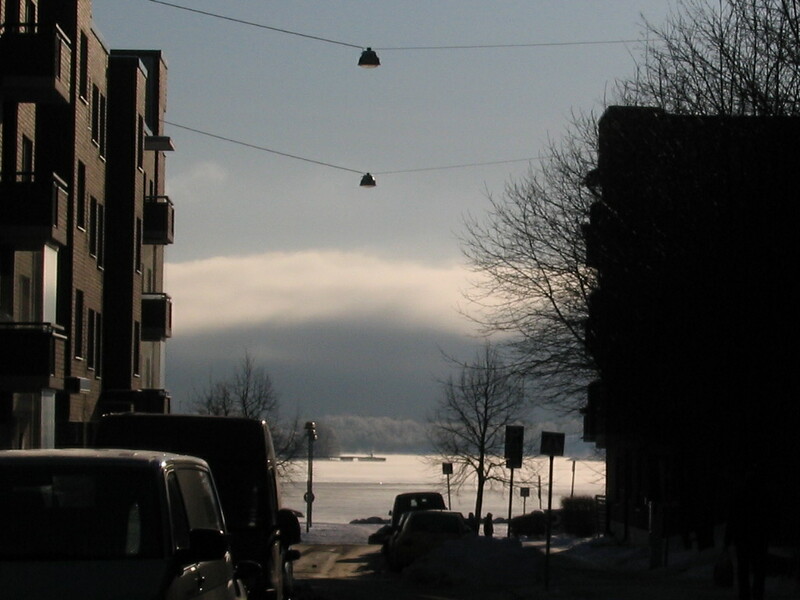 Katajanokka is small enough that, here at the eastern end, clear sea views are easily had in most directions. The next bunch of shots are from the tram. 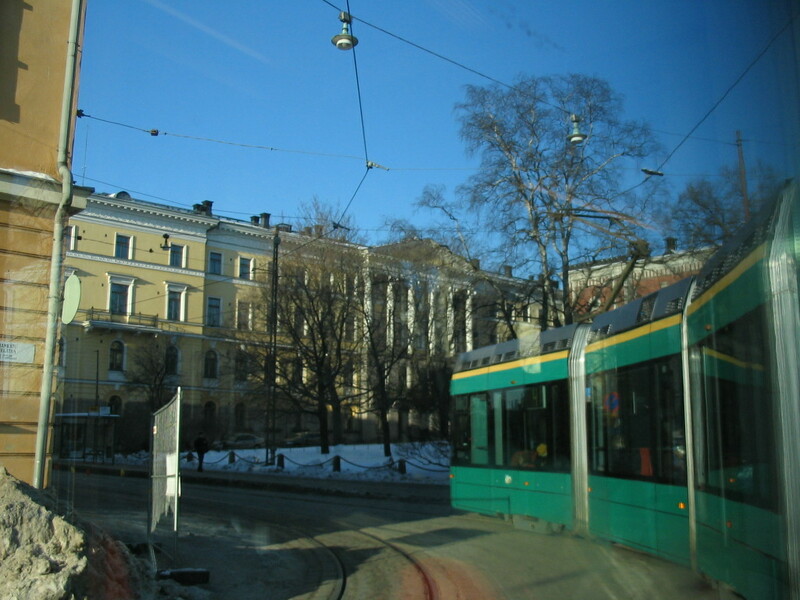 We were lucky to have a tram route (#4) circle around right at Merisotilaantori. 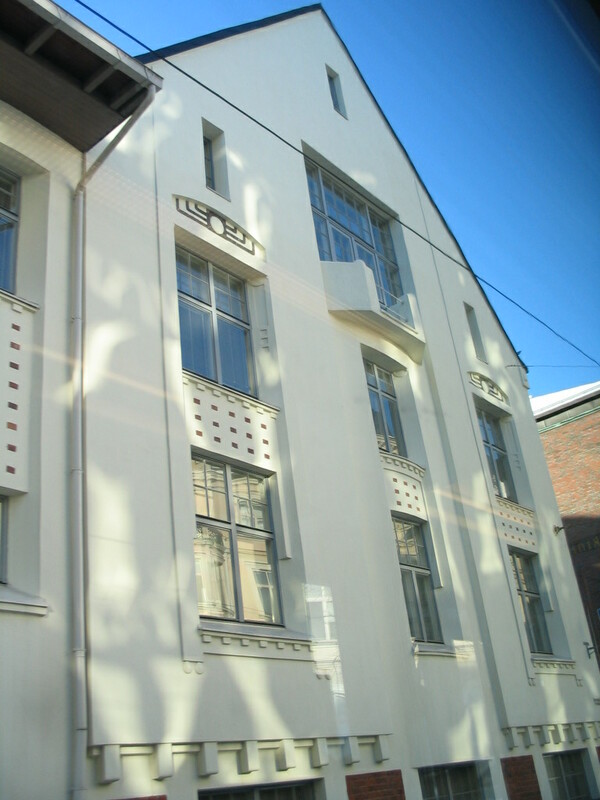 This is one of the larger, commercial Jugend buildings of Katajanokka, its north façade glimmering with sunlight reflected from the windows of the building across the street. 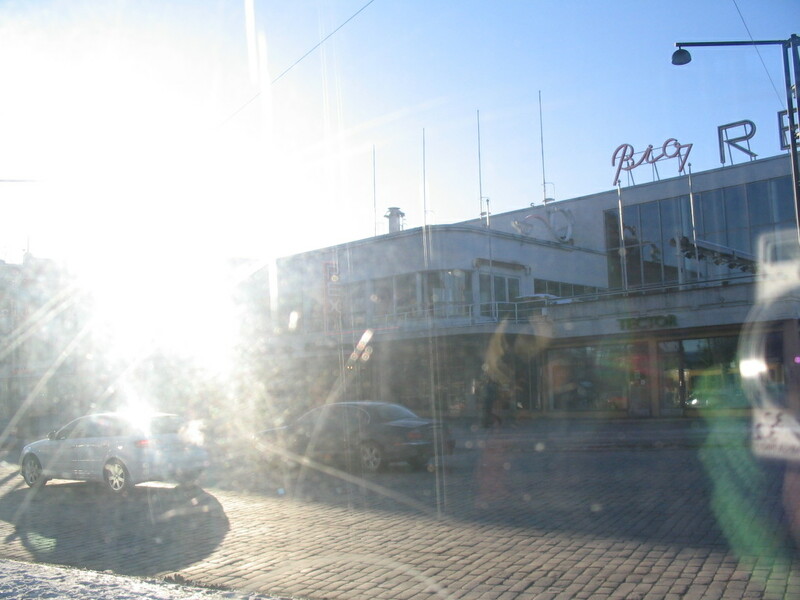 A drive-by closeup of Stora Enso and its bountiful bevels. 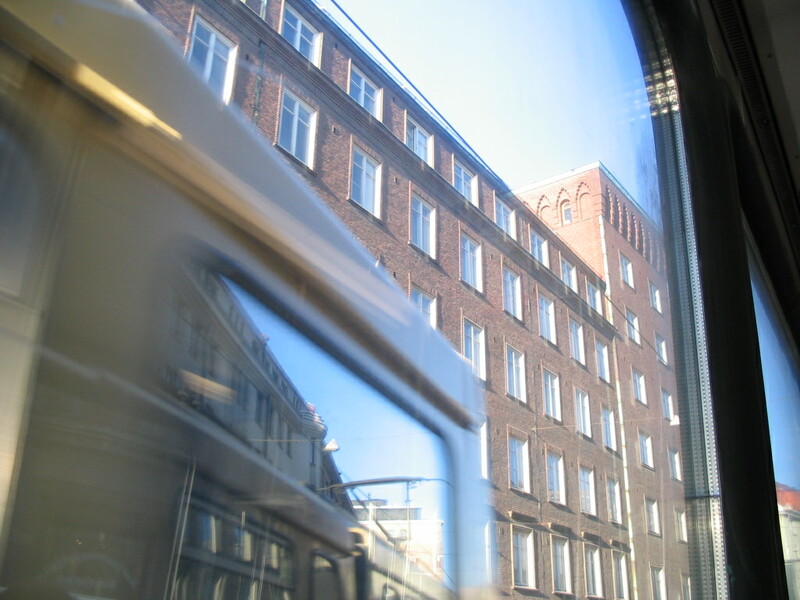 Rounding the corner on the tram onto Aleksanterinkatu. The view back toward Katajanokka down Aleksanterinkatu. 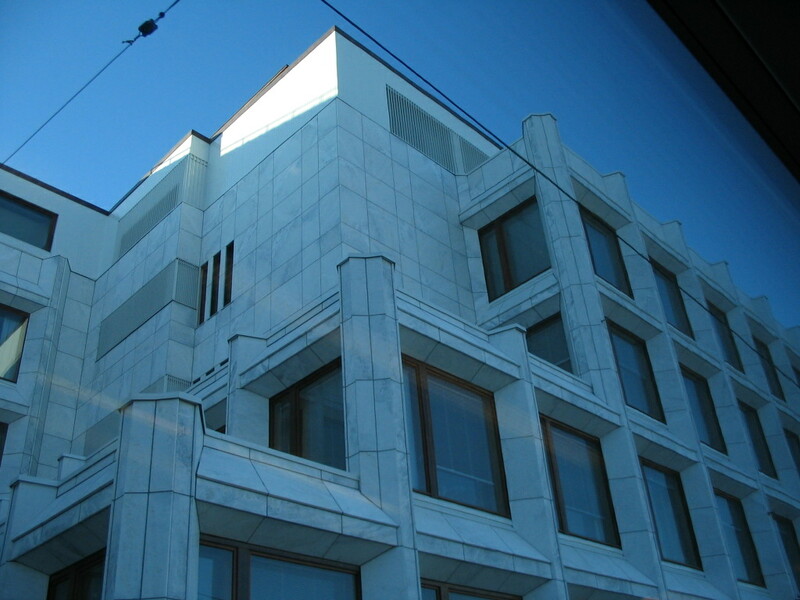 The opening to the left is Senaatintori (Senate Square), Helsinki's most important square. 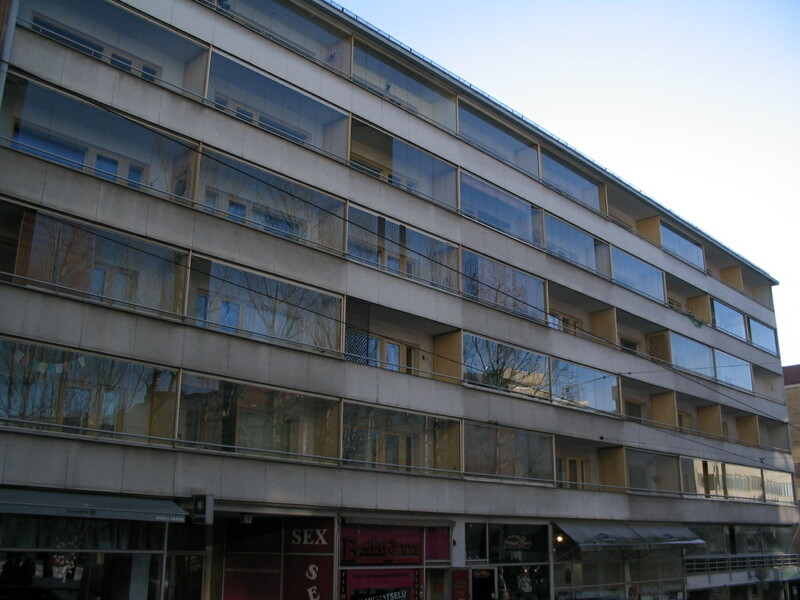 This is right in the center of town; the building is Lasipalatsi (the Glass Palace), an important example of early Finnish modernism. I included this really more for the blown-out effect of the sun through the tram window. Now on another tram, heading on to Kallio. 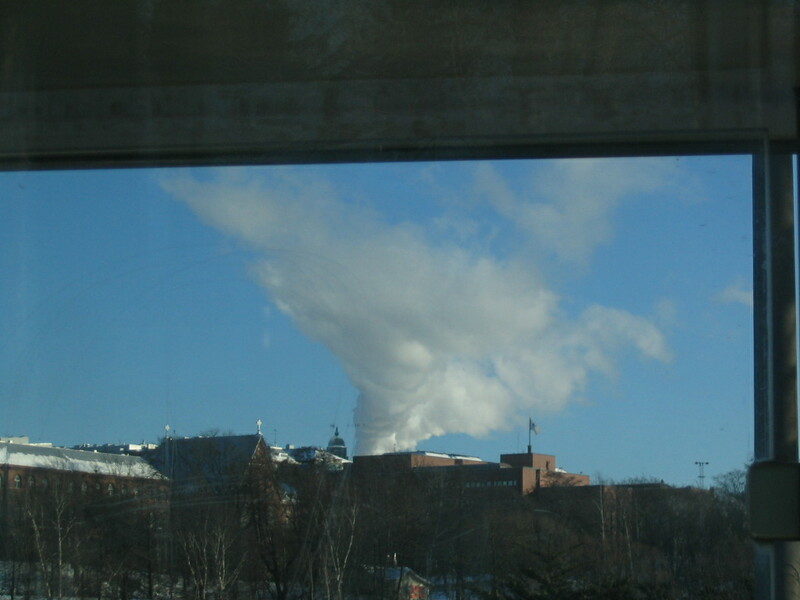 I enjoyed this steamcloud because it strongly resembled a disembodied tornado. 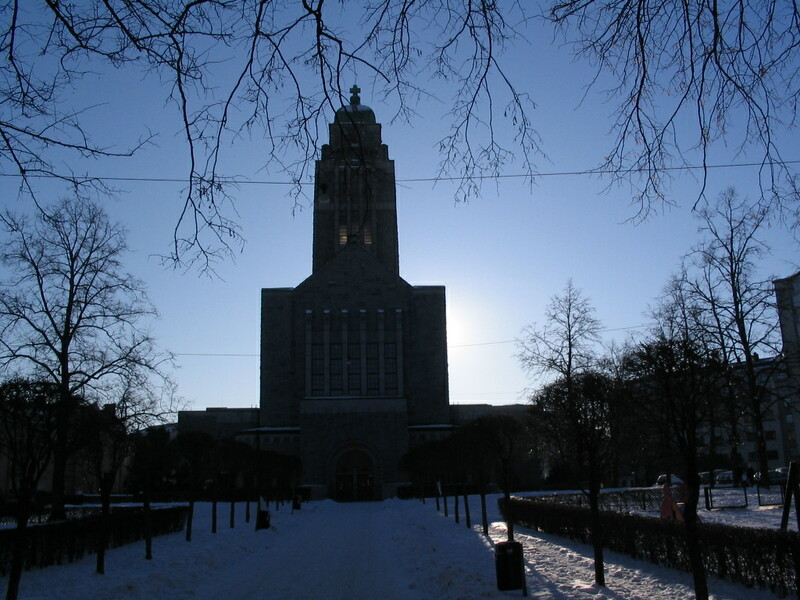 This is the Kallio church, designed by Lars Sonck, an important architect of the National Romantic/Jugend period; it was built in 1908-1912. 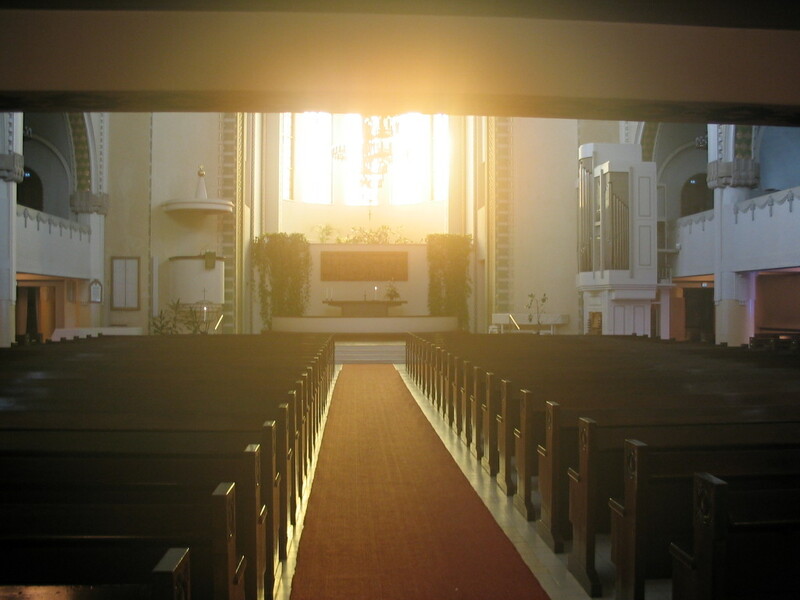 Getting into the nave of the church, soft lens thanks to my camera lens fogging up after coming in from the cold. 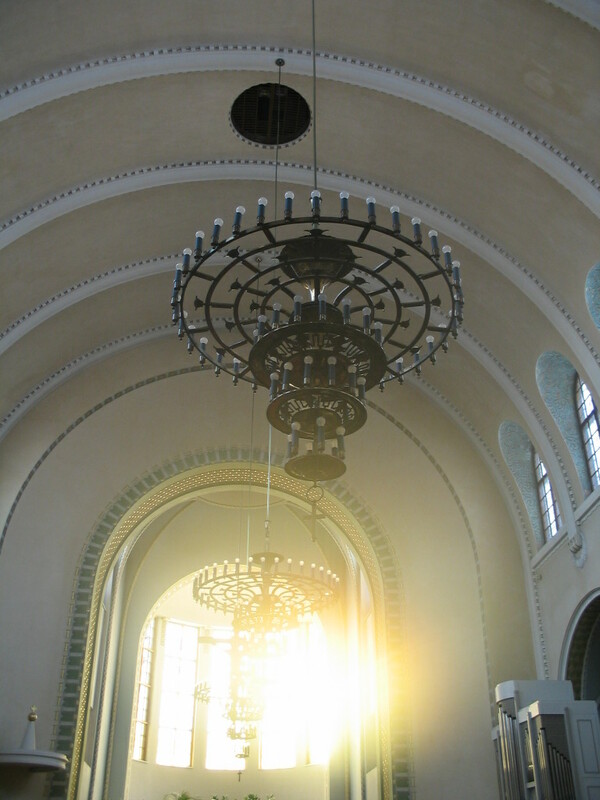 The nave's pleasant, simple barrel vault. A fun example of the exuberance of Jugend decoration. Slidable glass screens allow these balconies to adapt nicely to the different seasons. 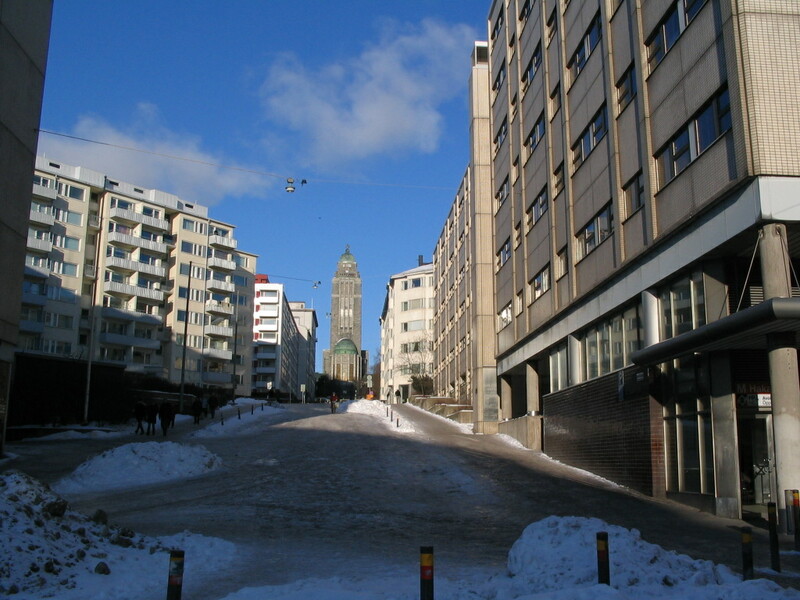 A view back up to the church up the steep street Siltasaarenkatu, which along with its downtown continuation Unioninkatu forms one of the longest street axes in Helsinki.